Particle MCMC (the use of approximate SMC proposals within exact MCMC algorithms) is arguably one of the most important developments in computational Bayesian inference of the 21st Century. The key concepts underlying these methods are described in a famously impenetrable “read paper” by Andrieu et al (2010). Probably the most generally useful method outlined in that paper is the particle marginal Metropolis-Hastings (PMMH) algorithm that I have described previously – that post is required preparatory reading for this one. In this post I want to discuss some of the other topics covered in the pMCMC paper, leading up to a description of the particle Gibbs sampler. The basic particle Gibbs algorithm is arguably less powerful than PMMH for a few reasons, some of which I will elaborate on. But there is still a lot of active research concerning particle Gibbs-type algorithms, which are attempting to address some of the deficiencies of the basic approach. Clearly, in order to understand and appreciate the recent developments it is first necessary to understand the basic principles, and so that is what I will concentrate on here. I’ll then finish with some pointers to more recent work in this area. I will adopt the same approach and notation as for my post on the PMMH algorithm, using a simple bootstrap particle filter for a state space model as the SMC proposal. It is simplest to understand particle Gibbs first in the context of known static parameters, and so it is helpful to first reconsider the special case of the PMMH algorithm where there are no unknown parameters and only the state path, of the process is being updated. That is, we target (for known, fixed, ) rather than . This special case is known as the particle independent Metropolis-Hastings (PIMH) sampler. and that in this case the marginal distribution of the accepted path is exactly . Again, be sure to see the previous post for the explanation. as this will lead to accepted paths with the exact marginal distribution. For the PIMH this modification is achieved using a Metropolis-Hastings correction, but we now try to avoid this by instead conditioning on the previously accepted path. For this target the accepted paths have exactly the required marginal distribution, so we now write the target as the product of the marginal for the current path times a conditional for all of the remaining variables. The terms in the denominator are precisely the terms in the numerator corresponding to the current path, and hence “cancel out” the current path terms in the numerator. It is therefore clear that we can sample directly from this conditional distribution by running a bootstrap particle filter that includes the current path and which leaves the current path fixed. This is the conditional SMC (CSMC) update, which here is just a conditional bootstrap particle filter update. It is clear from the form of the conditional density how this filter must be constructed, but for completeness it is described below. The bootstrap filter is run conditional on one trajectory. This is usually the trajectory sampled at the last run of the particle filter. The idea is that you do not sample new state or ancestor values for that one trajectory. Note that this guarantees that the conditioned on trajectory survives the filter right through to the final sweep of the filter at which point a new trajectory is picked from the current selection of paths, of which the conditioned-on trajectory is one. Let be the path that is to be conditioned on, with ancestral lineage . Then, for , sample and set . Now suppose that at time we have a weighted sample from . First resample by sampling . Next sample . Then for all set and normalise with . Propagate this weighted set of particles to the next time point. At time select a single trajectory by sampling . This defines a block Gibbs sampler which updates of the random variables in the augmented state space at each iteration. Since the block of variables to be updated is random, this defines an ergodic sampler for particles, and we have explained why the marginal distribution of the selected trajectory is the exact conditional distribution. Before going on to consider the introduction of unknown parameters, it is worth considering the limitations of this method. One of the main motivations for considering a Gibbs-style update was concern about the “stickiness” of a Metropolis independence sampler. However, it is clear that conditional SMC updates also have the potential to stick. For a large number of time points, particle filter genealogies coalesce, or degenerate, to a single path. Since here we are conditioning on the current path, if there is coalescence, it is guaranteed to be to the previous path. So although the conditional SMC updates are always accepted, it is likely that much of the new path will be identical to the previous path, which is just another kind of “sticking” of the sampler. This problem with conditional SMC and particle Gibbs more generally is well recognised, and quite a bit of recent research activity in this area is directed at alleviating this sticking problem. The most obvious strategy to use is “backward sampling” (Godsill et al, 2004), which has been used in this context by Lindsten and Schon (2012), Whiteley et al (2010), and Chopin and Singh (2013), among others. Another related idea is “ancestor sampling” (Lindsten et al, 2014), which can be done in a single forward pass. Both of these techniques work well, but both rely on the tractability of the transition kernel of the state space model, which can be problematic in certain applications. As we are working in the context of Gibbs-style updates, the introduction of static parameters, , into the problem is relatively straightforward. It turns out to be correct to do the obvious thing, which is to alternate between sampling given and the currently sampled path, , and sampling a new path using a conditional SMC update, conditional on the previous path in addition to and . Although this is the obvious thing to do, understanding exactly why it works is a little delicate, due to the augmented state space and conditional SMC update. However, it is reasonably clear that this strategy defines a “collapsed Gibbs sampler” (Lui, 1994), and so actually everything is fine. This particular collapsed Gibbs sampler is relatively easy to understand as a marginal sampler which integrates out the augmented variables, but then nevertheless samples the augmented variables at each iteration conditional on everything else. Note that the Gibbs update of may be problematic in the context of a state space model with intractable transition kernel. In a subsequent post I’ll show how to code up the particle Gibbs and other pMCMC algorithms in a reasonably efficient way. Andrieu, Christophe, Arnaud Doucet, and Roman Holenstein. “Particle Markov chain Monte Carlo methods.” Journal of the Royal Statistical Society: Series B (Statistical Methodology) 72.3 (2010): 269-342. Chopin, Nicolas, and Sumeetpal S. Singh. “On the particle Gibbs sampler.” arXiv preprint arXiv:1304.1887 (2013). Godsill, Simon J., Arnaud Doucet, and Mike West. “Monte Carlo smoothing for nonlinear time series.” Journal of the American Statistical Association 99.465 (2004). Lindsten, Fredrik, and Thomas B. Schön. “On the use of backward simulation in the particle Gibbs sampler.” Acoustics, Speech and Signal Processing (ICASSP), 2012 IEEE International Conference on. IEEE, 2012. Lindsten, Fredrik, Michael I. Jordan, and Thomas B. Schön. “Particle Gibbs with Ancestor Sampling.” arXiv preprint arXiv:1401.0604 (2014). Liu, Jun S. “The collapsed Gibbs sampler in Bayesian computations with applications to a gene regulation problem.” Journal of the American Statistical Association 89.427 (1994): 958-966. Whiteley, Nick, Christophe Andrieu, and Arnaud Doucet. “Efficient Bayesian inference for switching state-space models using discrete particle Markov chain Monte Carlo methods.” arXiv preprint arXiv:1011.2437 (2010). For many years I’ve had a passing interest in functional programming and languages which support functional programming approaches. I’m also quite interested in MOOCs and their future role in higher education. So I recently signed up for my first on-line course, Functional Programming Principles in Scala, via Coursera. I’m around half way through the course at the time of writing, and I’m enjoying it very much. I knew that I didn’t know much about Scala before starting the course, but during the course I’ve also learned that I didn’t know as much about functional programming as I thought I did, either! 😉 The course itself is very interesting, the assignments are well designed and appropriately challenging, and the web infrastructure to support the course is working well. I suspect I’ll try other on-line courses in the future. Functional programming emphasises immutability, and discourages imperative programming approaches that use variables that can be modified during run-time. There are many advantages to immutability, especially in the context of parallel and concurrent programming, which is becoming increasingly important as multi-core systems become the norm. I’ve always found functional programming to be intellectually appealing, but have often worried about the practicalities of using functional programming in the context of scientific computing where many algorithms are iterative in nature, and are typically encoded using imperative approaches. The Scala programming language is appealing to me as it supports both imperative and functional styles of programming, as well as object oriented approaches. However, as a result of taking this course I am now determined to pursue functional approaches further, and get more of a feel for how practical they are for scientific computing applications. At the time I wrote that post I knew even less about Scala than I do now, so I created the code by starting from the Java version and removing all of the annoying clutter! 😉 Clearly this code has an imperative style, utilising variables (declared with var) x and y having mutable state that is updated by a nested for loop. This algorithm is typical of the kind I use every day, so if I can’t re-write this in a more functional style, removing all mutable variables from my code, then I’m not going to get very far with functional programming! In fact it is very easy to re-write this in a more functional style without utilising mutable variables. One possible approach is presented below. JAGS (Just Another Gibbs Sampler) is a general purpose MCMC engine similar to WinBUGS and OpenBUGS. I have a slight preference for JAGS as it is free and portable, works well on Linux, and interfaces well with R. It is tempting to write a tutorial introduction to JAGS and the corresponding R package, rjags, but there is a lot of material freely available on-line already, so it isn’t really necessary. If you are new to JAGS, I suggest starting with Getting Started with JAGS, rjags, and Bayesian Modelling. In this post I want to focus specifically on the problem of inlining JAGS models in R scripts as it can be very useful, and is usually skipped in introductory material. Now rjags is a CRAN package, so it can be installed in the usual way with install.packages("rjags"). However, taking JAGS and rjags direct from the Ubuntu repos should help to ensure that the versions of JAGS and rjags are in sync, which is a good thing. This is all fine, and it can be very useful to have the model declared in a separate file, especially if the model is large and complex, and you might want to use it from outside R. However, very often for simple models it can be quite inconvenient to have the model separate from the R script which runs it. In particular, people often have issues with naming files correctly, making sure R is looking in the correct directory, moving the model with the R script, etc. So it would be nice to be able to just inline the JAGS model within an R script, to keep the model, the data, and the analysis all together in one place. Now, although there is a file containing the model temporarily involved, the script is stand-alone and portable. The solution above works fine, but still involves writing a file to disk and reading it back in again, which is a bit pointless in this case. We can solve this by using another under-appreciated R function, textConnection(). Many R functions which take a file as an argument will work fine if instead passed a textConnection object, and the rjags function jags.model() is no exception. Here, instead of writing the model string to disk, we can turn it into a textConnection object and then pass that directly into jags.model() without ever actually writing the model file to disk. This is faster, neater and cleaner. An R session which takes this approach is given below. This is my preferred way to use rjags. Note again that textConnection objects have many and varied uses and applications that have nothing to do with rjags. I’ve recently taken delivery of a Raspberry Pi mini computer. For anyone who doesn’t know, this is a low cost, low power machine, costing around 20 GBP (25 USD) and consuming around 2.5 Watts of power (it is powered by micro-USB). This amazing little device can run linux very adequately, and so naturally I’ve been interested to see if I can get MCMC codes to run on it, and to see how fast they run. 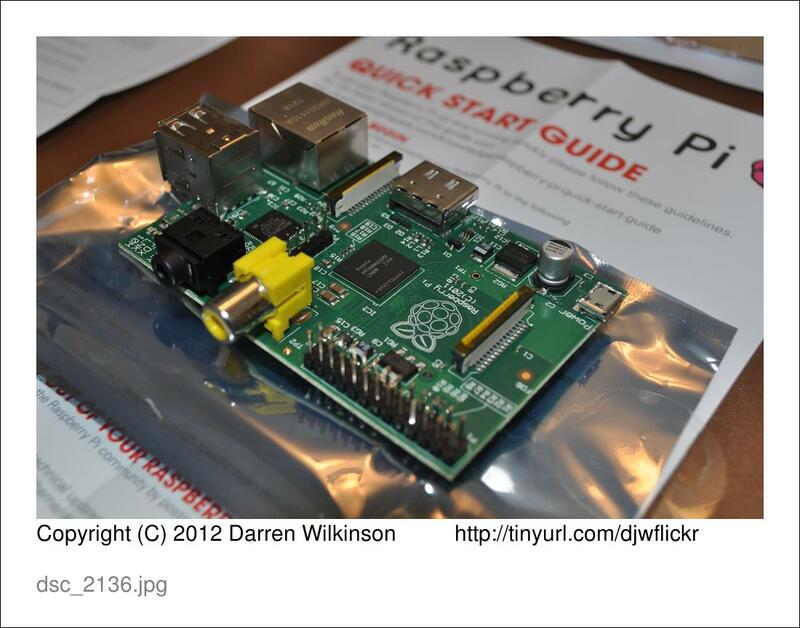 Now, I’m fairly sure that the majority of readers of this blog won’t want to be swamped with lots of Raspberry Pi related posts, so I’ve re-kindled my old personal blog for this purpose. Apart from this post, I’ll try not to write about my experiences with the Pi here on my main blog. Consequently, if you are interested in my ramblings about the Pi, you may wish to consider subscribing to my personal blog in addition to this one. Of course I’m not guaranteeing that the occasional Raspberry-flavoured post won’t find its way onto this blog, but I’ll try only to do so if it has strong relevance to statistical computing or one of the other core topics of this blog. In order to get started with MCMC on the Pi, I’ve taken the C code gibbs.c for a simple Gibbs sampler described in a previous post (on this blog) and run it on a couple of laptops I have available, in addition to the Pi, and looked at timings. The full details of the experiment are recorded in this post over on my other blog, to which interested parties are referred. Here I will just give the “executive summary”. The code runs fine on the Pi (running Raspbian), at around half the speed of my Intel Atom based netbook (running Ubuntu). My netbook in turn runs at around one fifth the speed of my Intel i7 based laptop. So the code runs at around one tenth of the speed of the fastest machine I have conveniently available. As discussed over on my other blog, although the Pi is relatively slow, its low cost and low power consumption mean that is has a bang-for-buck comparable with high-end laptops and desktops. Further, a small cluster of Pis (known as a bramble) seems like a good, low cost way to learn about parallel and distributed statistical computing. As I’ve explained previously, I’m gradually coming around to the idea of using Java for the development of MCMC codes, and I’m starting to build up a collection of simple examples for getting started. One of the advantages of Java is that it includes a standard cross-platform GUI library. This might not seem like the most important requirement for MCMC, but can actually be very handy in several contexts, particularly for monitoring convergence. One obvious context is that of image analysis, where it can be useful to monitor image reconstructions as the sampler is running. In this post I’ll show three very small simple Java classes which together provide an application for running a Gibbs sampler on a (non-stationary, unconditioned) Gaussian Markov random field. The model is essentially that the distribution of each pixel is defined intrinsically, dependent only on its four nearest neighbours on a rectangular lattice, and here the distribution will be Gaussian with mean equal to the sample mean of the four neighbouring pixels and a fixed (unit) variance. On its own this isn’t especially useful, but it is a key component of many image analysis applications. Hopefully this code is largely self-explanatory, but relies on a class called Mrf which contains all of the logic associated with the GMRF. This should compile the code and run the application, which will show a GMRF updating for 1000 iterations. When the 1000 iterations are complete, the application writes the final image to a file and then quits. Again, the code should be reasonably self explanatory, and will compile and run in the same way provided that Parallel COLT is installed and in your classpath. This version runs approximately twice as fast as the previous version on all of the machines I’ve tried it on. Hunt, K.A. (2010) The Art of Image Processing with Java, A K Peters/CRC Press. Regular readers of this blog will know that in April 2010 I published a short post showing how a trivial bivariate Gibbs sampler could be implemented in the four languages that I use most often these days (R, python, C, Java), and I discussed relative timings, and how one might start to think about trading off development time against execution time for more complex MCMC algorithms. I actually wrote the post very quickly one night while I was stuck in a hotel room in Seattle – I didn’t give much thought to it, and the main purpose was to provide simple illustrative examples of simple Monte Carlo codes using non-uniform random number generators in the different languages, as a starting point for someone thinking of switching languages (say, from R to Java or C, for efficiency reasons). It wasn’t meant to be very deep or provocative, or to start any language wars. Suffice to say that this post has had many more hits than all of my other posts combined, is still my most popular post, and still attracts comments and spawns other posts to this day. Several people have requested that I re-do the post more carefully, to include actual timings, and to include a few additional optimisations. Hence this post. For reference, the original post is here. A post about it from the python community is here, and a recent post about using Rcpp and inlined C++ code to speed up the R version is here. Note the factor of two in the variance of the full conditional for . Given the full conditionals, it is simple to alternately sample from them to construct a Gibbs sampler for the target distribution. We will run a Gibbs sampler with a thin of 1000 and obtain a final sample of 50000. I discuss timings in detail towards the end of the post, but this code is slow, taking over 7 minutes on my (very fast) laptop. Now, the above code is typical of the way code is often structured in R – doing as much as possible in memory, and writing to disk only if necessary. However, this can be a bad idea with large MCMC codes, and is less natural in other languages, anyway, so below is an alternative version of the code, written in more of a scripting language style. This code actually turns out to be a slightly slower than the in-memory version for this simple example, but for larger problems I would not expect that to be the case. I always analyse MCMC output using R, whatever language I use for running the algorithm, so for completeness, here is a bit of code to load up the data file, do some plots and compute summary statistics. To my astonishment, this “just worked”, and gave very impressive speed-up over regular python, running in around 30 seconds. This actually makes python a much more realistic prospect for the development of MCMC codes than I imagined. However, I need to understand the limitations of PyPy better – for example, why doesn’t everyone always use PyPy for everything?! It certainly seems to make python look like a very good option for prototyping MCMC codes. Traditionally, I have mainly written MCMC codes in C, using the GSL. C is a fast, efficient, statically typed language, which compiles to native code. In many ways it represents the “gold standard” for speed. So, here is the C code for this problem. This runs faster than anything else I consider in this post, taking around 8 seconds. This takes around 11.6s seconds on my laptop. This is well within a factor of 2 of the C version, and around 3 times faster than even the PyPy python version. It is around 40 times faster than R. Java looks like a good choice for implementing MCMC codes that would be messy to implement in C, or that need to run places where it would be fiddly to get native codes to run. This code takes around 11.8s on my laptop – almost as fast as the Java code! So, on the basis of this very simple and superficial example, it looks like scala may offer the best of all worlds – a nice, elegant, terse programming language, functional and O-O programming styles, the safety of static typing, the ability to call on Java libraries, great speed and efficiency, and the portability of Java! Very interesting. Again, rather amazingly, this code runs in around 35 seconds – very similar to the speed of PyPy. This makes Groovy also seem like a potential very attractive environment for prototyping MCMC codes, especially if I’m thinking about ultimately porting to Java. The laptop I’m running everything on is a Dell Precision M4500 with an Intel i7 Quad core (x940@2.13Ghz) CPU, running the 64-bit version of Ubuntu 11.04. I’m running stuff from the Ubuntu (Unity) desktop, and running several terminals and applications, but the machine is not loaded at the time each job runs. I’m running each job 3 times and taking the arithmetic mean real elapsed time. All timings are in seconds. The findings here are generally consistent with those of the old post, but consideration of PyPy, Groovy and Scala does throw up some new issues. I was pretty stunned by PyPy. First, I didn’t expect that it would “just work” – I thought I would either have to spend time messing around with my configuration settings, or possibly even have to modify my code slightly. Nope. Running python code with pypy appears to be more than 10 times faster than R, and only 4 times slower than C. I find it quite amazing that it is possible to get python code to run just 4 times slower than C, and if that is indicative of more substantial examples, it really does open up the possibility of using python for “real” problems, although library coverage is currently a problem. It certainly solves my “prototyping problem”. I often like to prototype algorithms in very high level dynamic languages like R and python before porting to a more efficient language. However, I have found that this doesn’t always work well with complex MCMC codes, as they just run too slowly in the dynamic languages to develop, test and debug conveniently. But it looks now as though PyPy should be fast enough at least for prototyping purposes, and may even be fast enough for production code in some circumstances. But then again, exactly the same goes for Groovy, which runs on the JVM, and can access any existing Java library… I haven’t yet looked into Groovy in detail, but it appears that it could be a very nice language for prototyping algorithms that I intend to port to Java. The results also confirm my previous findings that Java is now “fast enough” that one shouldn’t worry too much about the difference in speed between it and native code written in C (or C++). The Java language is much nicer than C or C++, and the JVM platform is very attractive in many situations. However, the Scala results were also very surprising for me. Scala is a really elegant language (certainly on a par with python), comes with all of the advantages of Java, and appears to be almost as fast as Java. I’m really struggling to come up with reasons not to use Scala for everything! MCMC codes are used by a range of different scientists for a range of different problems. However, they are very (most?) often used by Bayesian statisticians who use the algorithms to target a Bayesian posterior distribution. For various (good) reasons, many statisticians are heavily invested in R, like to use R as much as possible, and do as much as possible from within the R environment. These results show why R is not a good language in which to implement MCMC algorithms, so what is an R-dependent statistician supposed to do? One possibility would be to byte-code compile R code in an analogous way to python and pypy. The very latest versions of R support such functionality, but the post by Dirk Eddelbuettel suggests that the current version of cmpfun will only give a 40% speedup on this problem, which is still slower than regular python code. Short of a dramatic improvement in this technology, the only way forward seems to be to extend R using code from another language. It is easy to extend R using C, C++ and Java. I have shown in previous posts how to do this using Java and using C, and the recent post by Dirk shows how to extend using C++. Although interesting, this doesn’t really have much bearing on the current discussion. If you extend using Java you get Java-like speedups, and if you extend using C you get C-like speedups. However, in case people are interested, I intend to gather up these examples into one post and include detailed timing information in a subsequent post. In the previous post I looked at some simple methods for calling C code from R using a simple Gibbs sampler as the motivating example. In this post we will look again at the same Gibbs sampler, but now implemented in Java, and look at a couple of options for calling that code from an R session. Below is some Java code for implementing the bivariate Gibbs sampler discussed previously. It relies on Parallel COLT, which must be installed and in the Java CLASSPATH in order to follow the examples. As discussed in the previous post, it is possible to call any command-line program from inside an R session using the system() command. A small wrapper function for conveniently running this code from within R can be written as follows. This can then be run from within an R session with a simple call to gibbs(). Note that a random seed is being generated within R to be passed to the Java code to be used to seed the COLT random number generator used within the Java code. As previously discussed, for many long running codes, this approach can be quite effective, and is clearly very simple. However, there is an overhead associated with the system() call, and also with writing output to disk and then reading it back again. before re-starting R and re-attempting the installation. rJava provides a mechanism for starting a JVM within the running R session, creating objects, calling methods and having method return values returned to R. It is actually much more flexible than the .C() function for C code discussed in the previous post. In order to use this package for our example, we must first re-factor the code slightly in the following way. This code can be compiled and run from the command-line just as the previous code could. However, we have now separated out the code we want to be able to call from R into a static method called gibbs, which runs the Gibbs sampler and stores the result in a 2-dimensional array which is its return value. We can now see how to call this code from within a running R session. We first need to set up the R environment ready to call the code. Line 1 loads the package, line 2 starts up the JVM, and line 3 creates a link to the the GibbsR class (in general this is used to create a new Java object of the given type, but here we are using static methods). Java methods are called on Java objects using .jcall(). We can write a simple R function to conveniently call the method as follows. This can now be called with a simple jgibbs(). The first line of the function body carries out the actual method call. The return type of the method must be explicitly declared – “[[D” means a 2-dimensional array of doubles, using JNI notation. Care must also be taken to coerce the method parameters into the correct type that the Java method expects to receive. .jcall() is generally quite good at unpacking basic Java types into corresponding R types. However, the two dimensional array is here returned as an R list consisting of one-dimensional Java array objects. The unpacking is completed using the subsequent call to jevalArray() using sapply(), before the resulting matrix is tidied up and returned to the R session. We have looked at a couple of very simple methods for calling Java code from an R session. The rJava package is a very flexible mechanism for integrating Java code into R.
I haven’t found a lot of tutorial-level material on the web for the rJava package. However, the package itself has very good documentation associated with it. Start with the information on the rJava home page. From an R session with the rJava package loaded, help(package="rJava") lists the available functions, all of which have associated documentation. ?.jinit, ?.jnew, ?.jcall and ?.jevalArray provide further background and information on the example covered here. After that, the source code of R packages which use rJava are a useful source of further inspiration – look at the reverse-depends list for rJava in CRAN. In particular, the helloJavaWorld package is a tutorial for how to include Java code in an R package (read the associated vignette).